The first Panel of today has been introduced by Professor Thomas Kelch, who underlined how this issue is of extraordinary importance, since China is the most populous country in the world and its developments here are of vital importance. Pet ownership in China is a very new social phenomenon. Just think that the word "pet" in China did not actually exist until the 1960s. Having cats and dogs as pets is the most Western sense is something really new; before the most common kept animals were birds and fish, dogs emerged in China 15000 years ago but not as companion animals. Today the estimates say that there are 11 billion pets in China. Before the 1980s there dogs were not allowed in Chinese cities, but gradually the regulation began to loosen and in 1983 the city of Beijing first started to adopt regulations to control and restrict dog ownership. These regulations, done at city level, regard who can own a dog, which breed, how many, etc. ; the registration of dogs and vaccinations are also required. Today China also adopts the one dog per family policy, the vicious and dangerous dog prohibition, and various restrictions on breeds and size. Nevertheless there is no anti cruelty or animal welfare law in China, only some guidelines for zoos and entertainment animals, but no law whatsoever for companion animals and for the prevention of cruetly of any kind. The main objectives of such city regulations is to maintain public security and environmental sanitation. But the main problem of these regulations is the selective enforcement, especially the non-enforcement. For example dog owners are not allowed to abuse or abandon their dogs, but there has not been a single case of enforcement in the whole of China. For example, in the city of Shanghai there are more specific enforcement rules; the law says that those who violate the provisions of non-abandon shall pay a fine, their dog registration will be revoked, the dog put in a shelter, and they will not be able to keep another dog for the next 5 years. But this was also never enforced. 2. Government sanctions, such as dog beating squads (a very cruel practice) and dog pounds. Another controversial issue in China is the one regarding dog eating and the Dog Meat Festival. This is a very cruel practice because it is not limited to the killing and eating of the animal, but it comprises its beating and cruel treatment. 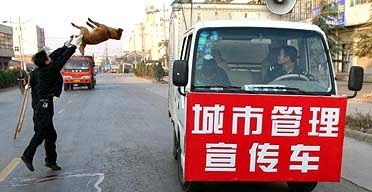 Unfortunately there is no law prohibiting dog or cat consumption in mainland China; there are only regulations related to food hygiene, safety, and transport. On the other hand there are more and more warm hearted Chinese, who do not tolerate this, and do rescue actions and protests against the Dog Meat Festival and the consumption of dog meat. Even though the liberation movements stopping trucks with cats and dogs going to restaurants are increasing, difficulties still remain because these animals are still seen as resources, tools, food, means to serve human purposes, and not as living beings. Many believe that animal law and animal rights are too ahead of its time for China. for sure reducing animal cruelty in China requires the efforts of Chinese and of non-Chinese. During the Tang Dynasty only the king consumed shark fin and later on, during the Ming Dynasty this privilege was extended to the members of the royal family. In the early Quing Dynasty also senior officials were granted this privilege, whilst in the late one also wealthy men could afford consuming shark fins. During Mao´s time this practice disappeared completely because of the communist regime, but after the Reformation period it gradually started to increase again. Currently shark fin consumption is not spread in the whole of China, it is limited to the coastal areas, especially to the cities of Guangdong, Fujan, Zehjiang, and is to be found in the restaurants of the major cities. Shark fin today is seen as a symbol of wealth and status, therefore it is usually consumed by businessmen. What about the public attitude today? More and more young people are taking action to stop this practice and to grow awareness between the Chinese population. Part of this movement are also young chefs, who increasingly refuse cooking with shark fins. Also the slogan to stop eating shark fin is very widely spread now in China. The market responses have also been significant with a price drop of 50% and a dramatic market shrink. positive is also the reduction of tourists consuming shark fin meat. The Government reactions to this issue have been multiple. Amongst the many we underline the Chinese IT Summit of 2011, where the Government announced that shark fin dishes would not appear in the official treat. Also the recently introduced prohibition to consume shark fins addressed to governmental officials is a big step forward. From a legal analysis we observe that all dynasties had animal protection regulations; in the contemporary China provisions who could address this issue can be found in the articles 9 and 26 of Constitution, in the Environment Protection Law, the Law on Protection of Wildlife, the Fisheries Law, the Food Safety Law, the Tort Law, and others include some principles. But how do we change the contemporary situation? First of all by constraining and decreasing consumption, furthermore by putting emphasis on production, by reaching a satisfactory level of enforcement, which is far from satisfaction, and finally by setting up a special agency and creating laws to protect sharks. The suggestion Dean Song Wei makes is to add sharks to the list of China National Key Protected Wild Animals and to create an effective supervision system, to avoid that legislation remains on paper. Lastly we addressed the new issues related to fake shark fins, which are made of corn starch and gelatine. Is this good or bad news? Some say it is good, since it avoids the hunting and consumption of real fins and it represents an invisible tax for the rich; some say it is bad, since those who can afford it don't want a fake; others say it might address and satisfy new needs (such as vegetarians), but the truth is we must stop both fake and real, because the production and consumption of fake fins will automatically increase the demand for real as it is a matter of prestige. To conclude we have to bear in mind the thoughts of the Chinese philosopher, Confucius, who stated that man has to live in harmony with nature. So shark fin consumption does not only go against the global sustainable trend, but also against this great Chinese philosophers´s thoughts. China is populated by 1.3 billion humans and is the larger meat producer in the world. It is also a country that has no national law against animal cruelty; there is only a law protecting wild animals or animals which serve an economic or scientific purpose. There is also no law regulating the treatment of lab animals and the Animal Husbandry Law does not address animal welfare at all. In this scenario, and as a response to different cruelty episodes, we are witnessing a growing mementum in China, oriented towards the protection of animals. One of these episodes happened in 2002 when a student of the Tsinghua University attacked with acid the bears at the Beijing Zoo, but there was no law to prosecute him. Eventually he was charged for damage of state property, but it had no penal consequences. Other episodes include the microwaving of puppy and the adopting and torturing of 30 cats by other top uni students, as well as the starvation of 11 Siberian Tigers in the Shenyang zoo. In all these cases there was no enforceable law, only the public outcry raised attention towards the matter. 1. Wild animals: it regulates also animals kept in captivity (e.g. in zoos), it targets common abuse actions (like de-clawing, feeding of live prey, etc. ), and cruel hunting practices. 2. Pet animals: it prohibits deliberate cruelty and abandon, and promotes adoption. 3. Farm animals: it prohibits abandon, and protects from cruel husbandry practices and inhumane slaughter, it contains regulations on transportation, and establishes protection for fur animals (china is the largest world producer of fur from minks, racoons, chinchillas, dogs, cats, rabbits), and it obliges to the compliance with OIE obligations. 4. Lab animals: it reflects the Guiding Opinions but makes them also criminally enforcable, it establishes that experiments which cause extreme pain can only be performed by vets. 5. Animals in entertainment: it prohibits cruelty during performances and the cruel keeping of the animals. It also establishes penalties for cruelty, especially fines and rewards for those who report animal abuse. The Draft Law was submitted in 2011 to NPC (National People´s Congress) and is awaiting further development. Modern animal protection laws don´t just prohibit cruelty, but they actively prevent it. It does not matter if we call it neglect or cruelty, what matters is that there is something we need to protect.